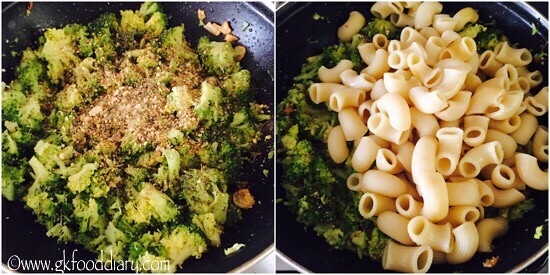 Broccoli pasta – easy healthy breakfast or quick snack recipe made with pasta,cheese & broccoli. 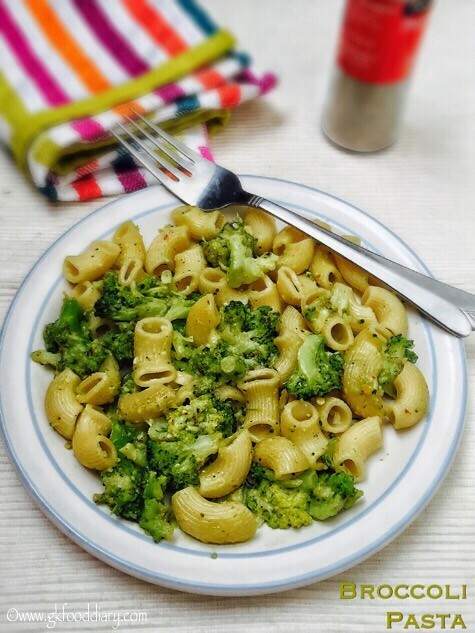 I am exploring with broccoli recipes and this broccoli pasta is my recent try and was a instant hit at home:) Broccoli with pasta is so filling, yum and perfect for kids. 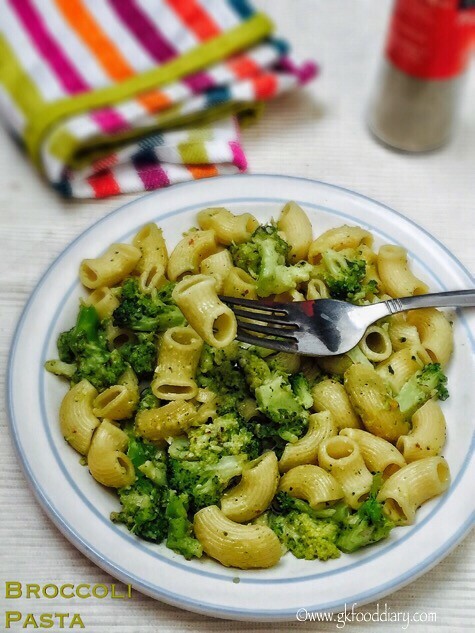 This broccoli pasta can be given to babies after 10 months once they started eating all family foods. Check here on when and how to introduce pasta to babies. 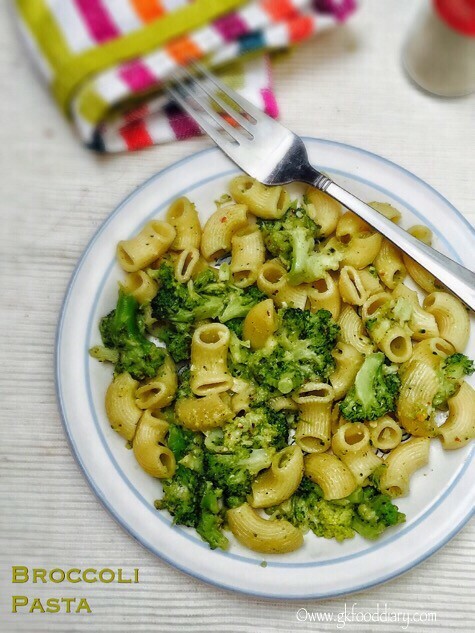 Do try this broccoli pasta for yourself & little ones and enjoy the pasta! 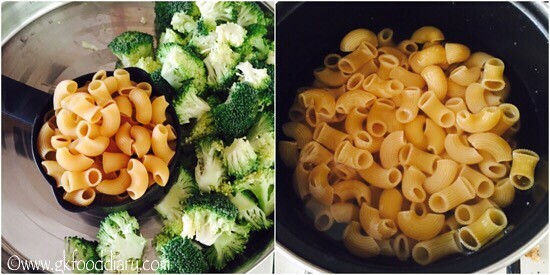 Here is how to make easy and healthy broccoli pasta recipe for babies, toddlers and kids. 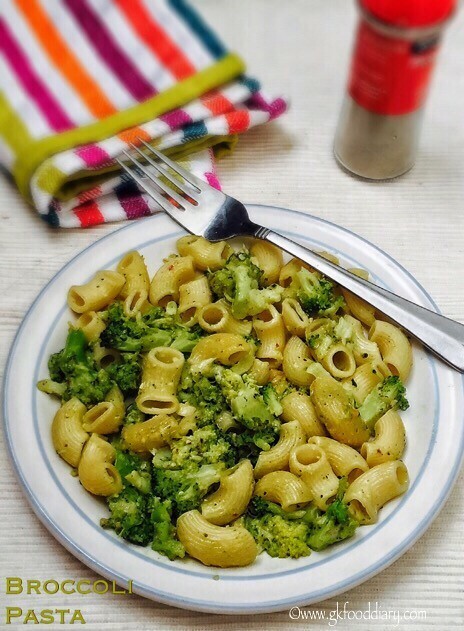 Broccoli Pasta - Healthy breakfast or evening snack made with broccoli, pasta and cheese. Wash broccoli and cut them into small florets. Keep all ingredients ready. 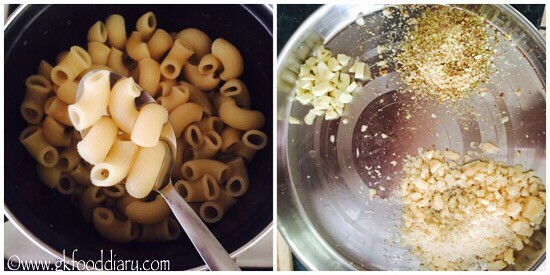 Cook pasta in a saucepan with required water and salt for 8-10 minutes or follow the pack instructions. Once the pasta is cooked, strain it and keep aside. Finely chop garlic cloves and grate cheese. Set aside. Take juice from lemon and keep it ready. Cook the broccoli florets with little turmeric powder and a cup of water. Switch off the flame once done. Broccoli florets should be cooked well and crispy enough to bite. 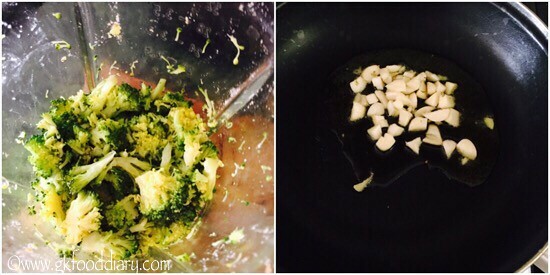 Shred the cooked broccoli florets in a blender. Keep aside. Heat olive oil in a pan, add garlic cloves. Saute them nicely until golden brown. Then add cooked broccoli florets along with nuts powder and toss it well. Now add cooked pasta and mix well. Then add grated cheese and toss it well for two to three minutes and switch off the flame, add lemon juice. 1. Wash broccoli and cut them into small florets. 2. Once the pasta is cooked, strain it and keep aside. Finely chop garlic cloves and grate cheese. Set aside. Take juice from lemon and keep it ready. 3. 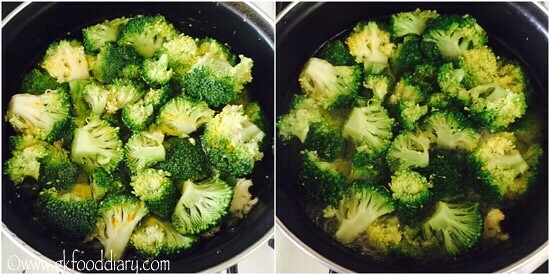 Cook the broccoli florets with little turmeric powder and a cup of water. Switch off the flame once done. Broccoli florets should be cooked well and crispy enough to bite. 4. Shred the cooked broccoli florets in a blender. Keep aside. Heat olive oil in a pan, add garlic cloves. Saute them nicely until golden brown. 5. Then add cooked broccoli florets along with nuts powder and toss it well. Now add cooked pasta and mix well. 6. Then add grated cheese and toss it well for two to three minutes and switch off the flame, add lemon juice. The tasty broccoli pasta is ready! I used elbow pasta variety, you can use penne pasta too. Parmesan cheese or cheddar cheese are apt for making this pasta. I used parmesan. Instead of nuts powder you can use tiny cut almonds, pistachios and cashews. You can shred the broccoli using a hand or with blender. You could add cooked broccoli florets as such too. 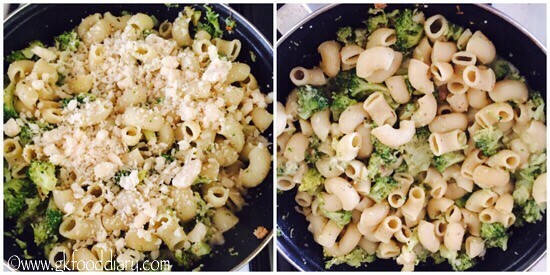 Make sure to introduce everything separate to your baby before you try this broccoli pasta.